Hello Hello! Happy Friday! It's Friday the 13th today! EEEEEEK! So far nothing scary has happened to me today (except for my utter inability to control blemishes, but that's a side story). Exciting things are happening in manfriend's world today, can't divulge but big things are shaking! Weekend, hurry up please, I want to celebrate! 1. This week, a New Zealand man won the National Scrabble Championships here in Dallas. He won with the word "zarf," which is a handle-less coffee cup holder. I have a few questions.... (1) How can a New Zealander win the "National" Championship? (2) How the hell did I not know this fierce competition was going on in my fair city? I love scrabble and that would have made for a fabulous experience and even better blog post. (3) "Zarf"? What the hell? This is awkward for so many reasons. Why must she demonstrate this point wearing only a towel? And who is still harassing her about this? Does she think she's fooling us? Does anyone still care? 3. Period cramps may be affecting womens' brains. No, really. New research shows that women with menstrual cramps have noticeable and significant differences in brain structure. Compared with women who don't get cramps, the crampers had unexplained gray spots on MRI brain scans. 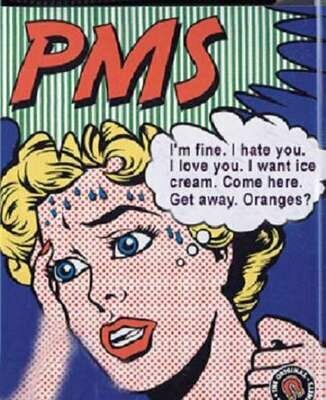 Hmm....just what we women need: legitimate research proving that PMS makes you crazier. Oh come on. Katy, you've sold out. I love you and I can't get enough of you, but you've sold out. There's nothing wrong with that. You're a millionaire. I'm insanely jealous of you, but lets just be clear that you're a popstar and selling out comes with the territory. 5.The Cathy comic strip will be retired this year, after a 34 year run. Cathy, the eternal calorie-counting, single (although she did get married in 2005), career girl has been a female icon. On top of being high-larious, she brought some of the first humor and mainstream commentary on the modern female experience. All that seriousness aside, she loves girly things, has crappy bosses, freqently has communication breakdowns with her man -- she's every woman. 6.A 75-year-old man had a pea plant sprouted inside his lung! Apparently, he inhaled a pea, presumably it accidentally went down the wrong pipe. He already had emphysema and started to get much sicker. They did X-rays to uncover a "grainy mass in his lung". Fearing that his condition had developed into full-blown lung cancer, they operated and found a sprouting pea! OMG. The warm damp conditions inside his lung were perfect growing conditions! This gives me the giggles because as a kid you were always told that eating seats (usually watermelon) would sprout in your belly. This apparently isn't entirely false! WHOA! I hope he kept it and re-planted it somewhere. Another funny element: in recovery, the hospital fed him peas. BAHAHAHAHAHA! Not only does he discuss his hormones, which he can't wait to kick in (weird, are those the moneymakers?) but he uses the word "zit" at least 30 times. He also says the line "totally right for kids like me." I guess this amount of awkwardness is the most teenager-like thing he's ever done. There is justice in this world. X. Paris Hilton is being sued for $35 million over hair extensions. Apparently she has a contract with one extension company and got caught wearing a competitor's weave. Oh come on, give me a break. The life of an heiress. My biggest hair problems are that I have to buy cheap haircuts. FML. Happy Friday! Today I'm staying in town for the first time in a while and I'm ecstatic about it! Have a super fantabulous sparkly amazing weekend everyone! I agree, that pea sprout thing is just crazy. I didn't even realize those things could spout. We always used to joke about watermellon seeds also. Hope you have a great weekend! I do wonder how I missed not one or two of these stories in the news..but MOST of them! The only one I had heard about was the Terri Hatcher one..Thanks for catching me up! Maybe Joan Rivers needs to watch herself on tv first before passing judgement on others. :P Also the pea plant freaked me out. I will never swallow another seed of any kind again. My goodness, that is a lot of CRAZY news! I can't fathom $35 million about hair! Just found your blog from Life of Meg! Your commentary is so funny, and I agree with all of it! Ummmm...Terri Hatcher thing definitely awkward! Joan Rivers comment doesn't surprise me considering the source but cracks me up! I look forward to stopping back again later.